In the Scriptural game of thrones, Abigail plays a key role in a surprise-filled plot. 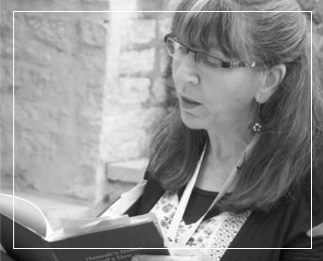 A strong woman of Scripture takes the lead – again. In the Scriptural game of thrones, Abigail plays a key role in a surprise-filled plot. A strong woman of the Bible take the lead – again. Why start my series on the women in King David’s life with Abigail? She’s not his first wife (Michal) nor is she the most famous (Bathsheba). Neither is she the daughter that his son, and David himself, so wronged (Tamar). But Abigail – her wisdom so powerfully revealed in so few slender verses – reaches out across the millennia in a way that has put her at the top of my list of strong women of the Bible. Abigail, by Riki Rothenberg. 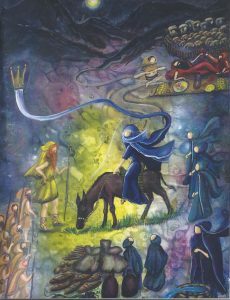 Abigail appears in the center, and red-headed David and his men at left. David’s future crown is tied, literally to Abigail. Nabal is carousing at top right. Courtesy of Riki Rothenberg. As usual, although Abigail is the heroine, it’s Nabal, a man of means – and a mean man – about whom we get all the details. And, seeking to understand more about Abigail from elsewhere in Scripture, we find that according to scholars, Abigail was no more than a means to an end for David. Nabal, we’re told in 1 Sam 25:3, was a Calebite chieftain. According to 1 Chron. 2:50–51, David must have been a descendant of the Calebites, through a man named Bethlehem (David’s ancestral city). By marrying Abigail, some say David attained vital Calebite support for his kingship. Indeed, David was eventually crowned in Calebite territory, in Hebron, where he spent seven years. But it’s in the story itself that Abigail reveals herself to us, with Haiku-like brevity and precision. Here we find a decisive, strong, quick-acting woman of faith, who rewrote not only her own history and future, but the history through which we descendants of the Judahites know ourselves. 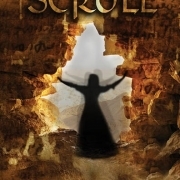 In that sense, Abigail was an inspiration for my first-generation heroine in my first historical novel, The Scroll, among the few survivors of Masada, who by her wisdom and sheer willpower, changed a bleak future overshadowed by men’s desires. The story in 1 Samuel 25 opens with David roaming the desert with band of 600 (!) outlaws. David had sent men to Nabal with a message: To paraphrase 1 Sam. 25:6–7: “We’ve been watching your shepherds now for some time, busy with the shearing of your prodigous flock, and, just so you know, they’re feeling fine.” Then came some over-the-top wishes for continued good health and wealth, and a request for supplies. Considering David had left behind 200 of his men to guard his own supplies, it seems hunger was not his motive, but rather a Corleone-style demand for protection money if ever there was one. Nabal mockingly refuses, and it’s all downhill from there. Swords girded, off they go. Abigail comes on the scene, having heard of the goings-on from a servant after the men involved had already sparked conflict. The quantity of supplies she presented to David might have fed Nabal’s household for no more than two days. That is, except for the extravagant “five dressed sheep,” which Abigail undoubtedly included to make a point – she was in charge, not Nabal. Abigail bows when she meets David, as her culture required. But using Nabal’s unfortunate nickname (“base fellow”) against him, she makes it clear that David will find dealing with her much different than with Nabal. Pretending that violence is the last thing on David’s mind, Abigail blesses the outlaw and future king with long life, the monarchy, victory over his enemies and a dynasty to boot. David, quite bowled over, sends her home with a promise that all will be well. Abigail then reports back to a drunken, carousing Nabal, who keels over when he hears what his wife had done without his knowledge and against his wishes. David “proposes” to Abigail (roses and champagne are not mentioned, but “taking” is…twice. That’s ancient culture for you; lucky we’re done with that…). Abigail agrees, describing herself as a lowly handmaid and foot-washer, in direct contradiction to what we have already come to appreciate about her. No need to dwell on David’s numerous flaws here. 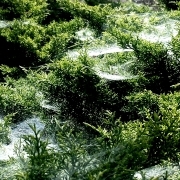 One of his most egregious sins had to do with another married woman who he brought into his life, with disastrous results. But David himself recognizes the role Abigail played in restraining his worst inclinations. That even God’s chosen king needed someone to keep him in line should comfort us ordinary mortals at this time of year, when New Year’s resolutions are already weakening for some. Abigail tells David that his life “will be bound securely in the bundle of life by the Lord your God.” Our sages, who counted Abigail among the seven prophetesses of Israel (Babylonian Talmud, tractate Megillah 14a), found that image so touching that they quoted it to describe what happens to the souls of the righteous after death (tractate Shabbat 152b). These poignant words are recited at Jewish funerals to this day. And thus, Abigail is still with us. Thank you, Abigail, of blessed memory, for your deeds, and the hope of eternity bound up in your words. C. Meyers (ed. 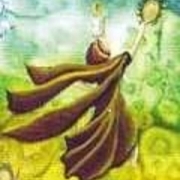 ), Women in Scripture (Grand Rapids, MI, 2000), pp. 43–44. J.D. Levenson and B. Halpern, “The Political Import of David’s Marriages,” Journal of Biblical Literature 99:4 (Dec.1980), pp. 507–518. 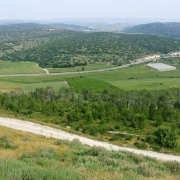 T. Kadari, “Abigail: Midrash and Aggadah.” https://jwa.org/encyclopedia/article/abigail-midrash-and-aggadah. 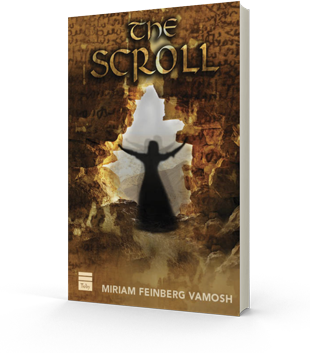 M. Feinberg Vamosh, The Scroll. 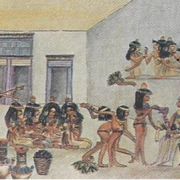 M, Feinberg Vamosh, Women at the Time of the Bible. My thoughts on Abigail are partly based ideas exchanged with the artist Riki Rothenberg, whose inspiring work adorns this blogpost. My thanks to Riki for allowing me to present them and her art to you.